RoboBrrd Brain Board v2 – Open Source under CERN OHL v1.1 « Adafruit Industries – Makers, hackers, artists, designers and engineers! Having various projects open source is a great learning tool. I probably wouldn’t have been able to make anything if there were no open source gEDA projects (Evil Mad Sciencemakes a lot of open source projects that use gEDA), or wouldn’t be able to make an Arduino derivative if it wasn’t open source, or wouldn’t have been able to check my voltage regulator circuit against an experts circuit! My goal for making the RoboBrrd Brain Board v2 open source is: someone will see the board with the artwork, want to put their own artwork on it, realise that it is possible, and learn all about schematics pcbs geda and bash in the process. Of course, hopefully they post a pic up online of their own board too! 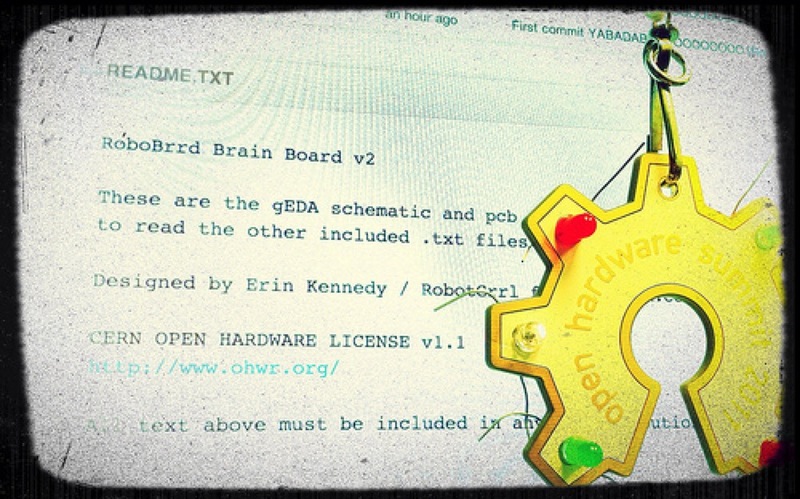 The RoboBrrd Brain Board v2 is open source under the CERN OHL v1.1. Here you can find the RoboBrrd Brain Board v2 files!